Left to right, Chad Niman, Jeff Stringer, Matthew Springer, Briana Fortunato, Bobby Ammerman, Billy Thomas, Renee Williams, Laurie Taylor Thomas, Eric Gracey, Ellen Crocker, Terry Conners. Photo provided. 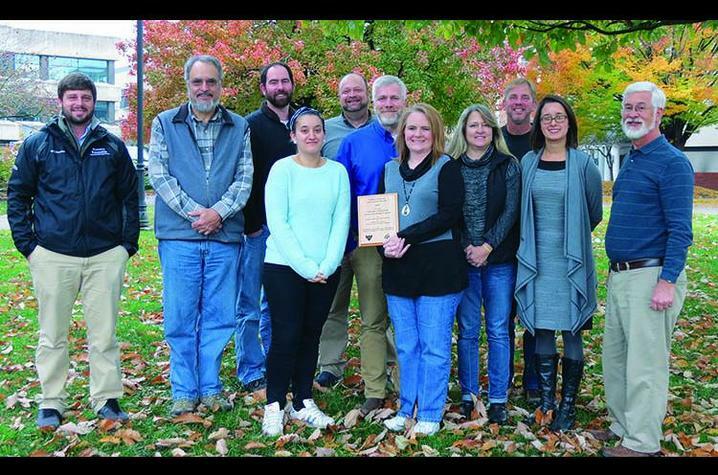 LEXINGTON, Ky. (Jan. 3, 2019) — The University of Kentucky Forestry and Natural Resources Cooperative Extension team recently won the Comprehensive Family Forests Education Award presented by the National Woodland Owners Association and the National Association of University Forest Resources Programs. Information about the programs and resources UK Cooperative Extension offers for Kentucky woodland owners is available online at http://forestry.ca.uky.edu/extension-home.